Life and how to live it: a subtle yet humorous critique of West German society (and by proxy, of western capitalist societies). 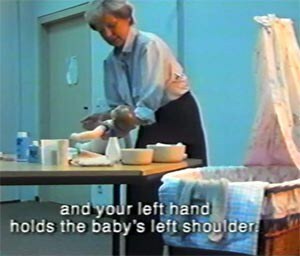 Harun Farocki's How To Live In The German Federal Republic, filmed in the first eight months of 1989 and released the following year, is now available on DVD courtesy of Facets Multi-Media. Farocki has been a prolific avant-garde filmmaker since the late '60s. His work illustrates a diverse array of cinematic techniques, genres, and conventions. 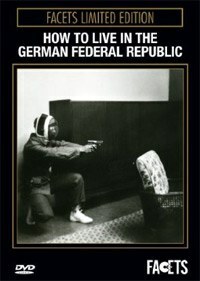 How To Live In The German Federal Republic – a collection of observational episodes recorded at adult education classes, training seminars, support groups and the like – offers a subtle critique of West German society (and, by proxy, western capitalist societies), from the standpoint of, albeit never openly addressed, Cold War era dichotomies of a "free individual" West versus a "regimented" East. The episodes on display, likely familiar to most of us in form if not content, challenge and complicate notions of autonomy within larger societal constructs – all with generous doses of good humor. Familiar programs observed include parenting classes, CPR, job interviews, sales, and vocational training. Odder lessons include crossing-the-street, exiting an upturned vehicle, what to do if locked out of your apartment, and stripping. Occasional shots of repetitive machinery are added to the mix and play as light refrains while adding a certain abstraction to the representations (although the curiously neutered dolls and mock uteruses on display in the child-bearing/rearing classes attain a level of abstraction on their own). How strangely removed these environments are from life-as-lived, especially as they enact what can be described as various forms of rehearsal. By emphasizing role playing games and a notion of acting and performing, day-to-day activity in these programs seems understood as a "role". The "actors" – the training students and seminar attendees – respond with varying degrees of earnestness and boredom. Loosely, as the film proceeds, the learned structures expand from the basic block of the family and children to rehearsed scenarios for agents of the security apparatus, and the witnessed events become, in turn, more and more absurd. Observed via rather deadpan camera setups, the accumulation of these activities offer a version of Brecht's defamiliarization technique (though one might hesitate assigning the label "epic theater"). Like Godard, Farocki amplifies the practice of montage – in the Eisensteinian sense – as a primary foundation of cinema. The film presents a sophisticated edit or, to be more precise, assembly, as it consists, for the most part, of connecting long, mostly static shots from the various locales. Within this schema, the links are essentially associative, with the occasional big jump cut to recontextualize the flow of events. Some sequences appear with no context, and find an "explanation" through reappearance. Other scenes feature video technology within the classrooms themselves, adding a further layer of observational removal. How To Live In The German Federal Republic presents its original German-language audio track, with clear non-intrusive English subtitles. The full-screen image matches the original 16mm aspect ratio. There are no extra features included with the disc. This could perhaps be identified as the one shortcoming as, after watching the film, curious viewers may wish for some details on the filmmaking process (there is some contextual information available on the Facets web site). This film appears as one of Facets' new Limited Edition Series, a collection of late 20th century experimental and avant-garde films, most of which had been gathered earlier for VHS. The DVD releases will continue through the upcoming months. This promises to be a fantastic opportunity to see many rarely screened but much-discussed works, with their warts and all. A brochure describing the series, included with the DVD, decries certain tendencies of DVD reviewers to favor "transfer quality and bit rate [more] than the historical context of the original film", which probably originates with the days of laserdisc and a high-end audiophile milieu. The 16mm source for this film is fine, and such technical criticisms of these films should hold as much weight as complaints that some of Stan Brakhage's films are out-of-focus.